If you’ve been following local politics related to transportation any time recently, you likely know that the Dallas City Council has shifted its stance in favor of a second downtown light rail (LRT) alignment to be below grade as a subway throughout downtown rather than the previous Locally Preferred Alternative (LPA), which was to be half below-grade in order to cross the existing downtown light rail line and half at-grade. However, since that decision the current LPA is now null and void (even though it was found to not be viable anyway). Since we would never build a subway alignment as long and crooked as possible, we can’t just bury the existing LPA alignment and call it a day. Therefore, there needs to be a new alignment. The new alignment must be determined in order to calculate costs, determine construction methods, coordinate with property owners and the city, develop the financial plan, and amend or re-submit the core capacity grant application to the Federal Transit Authority (FTA). You are going to get sick of acronyms by the end of this post, methinks. Like all things in urban design, transit alignments have trade-offs. There is no perfect solution. Everything has pros and cons and therefore a hierarchy of priorities and goals have to be determined and weighted in order to establish degrees of inviolability. What absolutely must occur? What should be done? What could be done if we’re able? And what should we absolutely not do, i.e. what is black, white, gray, and what are those shades of gray? In this post I will be exploring the viability, pros, and cons of various proposed routes as well as proposing some new routes. I’m not here to say any of these is perfect nor that any of these alignments should be the newly preferred alternative. Instead, I’m looking at this an intellectual exercise. What if we started from scratch? What are the goals and priorities for the alignment? And, in turn, what does applying those filters of goals and priorities then do to potential alignments as we apply them? Since I’m doing this as an intellectual exercise there are two value sets to consider. There are what I understand DART’s priorities and needs to be and those of good urban design. These sometimes align and sometimes do not. The key in urban design is to not bend the city to the infrastructure as much as bend the infrastructure to meet the needs and goals of the city (and when I say ‘city’ in this context, I mean good urbanism and the efficient, elegant functionality of the city. Not specifically Dallas, per se.). Since this is a thought exercise, it will even challenge some things understood to be constants. Note: I will be leaving out some oft-cited goals such as increased street life or economic development because there are simply too many variables to say for certain what effect routes will have. These are considerations down the road, unless of course there are development opportunities in conjunction with certain alignments that will help with financing the overall project if possible. An obvious priority is to minimize construction costs, which is why the surface alignment existed in the first place. However, as we’ve learned, every surface alignment has fatal flaws from length, to route, to street grid disruption, to threatening historically significant structures. Since saving costs by building on the surface are out the door, we have to look at either other ways to save costs by building a subway or building a more creative and comprehensive capital stack in order to get the subway built. There are two major expenses building subways, which are the length of the tunnel and the station areas. If we’re building D2 as a subway, we want to minimize length and stations (provided we are still providing enough stations to serve downtown destinations). Another must have is that there absolutely has to be at least one transfer point between the two downtown lines. DART may not like transfers, but that’s how transit systems maximize service without overextending themselves. Transfers are how every transit system in the world works. Riders will tolerate one transfer if it increases their accessibility to more places provided those transfers are quick and reliable. You just don’t want more than one. Since D2 provides the system with two branching lines there will never be more than one transfer anyway (as for the bus system, that’s for another time). The alignment should provide flexibility for construction methodology, whether it’s cut and cover or a deep bore tunnel. In general cut and cover is less expensive, although I’ve been hearing that deep bore drilling is getting more cost effective and the underlying geology in downtown Dallas is well-suited for a deep bore tunnel. However, there are other considerations to weigh. Cut and cover is shallower, allowing for better platform to street transitions, but it also has more significant impact during construction because you’re tearing up the streets. On the other hand, a deep bore tunnel is virtually innocuous (unless it causes downtown Seattle to sink or the drill gets stuck, like also in Seattle). It’s also much deeper, more than 50 feet below the surface. Like CityPlace, deep platforms can be undesirable. While the LPA shows a station at the Perot Museum, I am not going to consider that station sacrosanct. Considering DART has shown options C3 and C3a that do not provide a station at the Perot, I will consider this a flexibility as well. It would be nice to have, but not a priority if there are better alignments. All too often in this town, we bend infrastructural decisions to very specific destinations rather than building better lines and we end up with Rube-Goldbergian infrastructure. If you’re within a quarter mile of a station, you’ve got service (provided the walk is safe, direct, and enjoyable). Transit can’t provide door-to-door service. That’s how we get useless, cost ineffective transit. Minimize street disruption. That’s the entire purpose of subways in the first place (that and the cost of land in downtowns due to the economic activity at street level, which we don’t want to interrupt). The current LPA has something like 19 street closures or crossings. 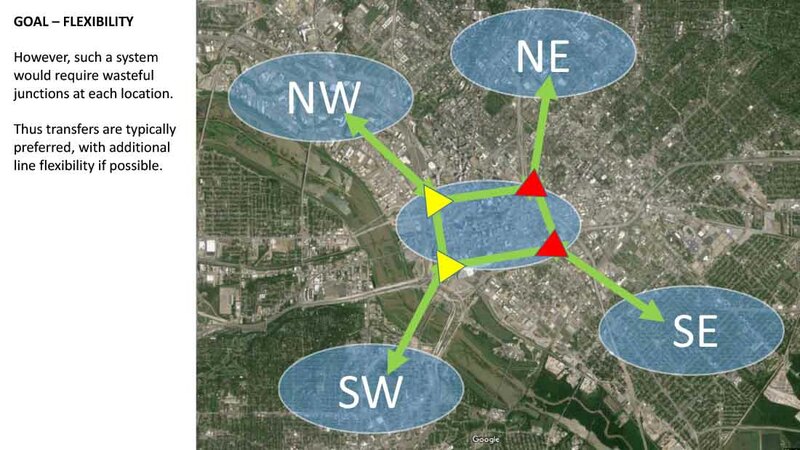 If aggregate CBD value is determined by the interconnectivity of the street grid and if we envision a vibrant, highly active and valuable downtown, then we must maximize street grid interconnectivity with minimal disruptions (so, minimizing highway impacts would be ideal as well). Something we also need to consider is the opportunity to leverage the construction of the subway line in order to maximize private investment without believing in magic. While some private investment may occur around stations in the future, I’m more concerned about whether we can plan for redevelopment in conjunction with the building of station areas. Federal TIFIA loans can pay for platforms, multi-modal transfer facilities, and help with transit-oriented development. If at all possible, I would strive to put a station under the East End bus transfer station that currently sits fallow and occupies a huge chunk of potentially valuable real estate. Can we turn the eastern half of downtown around with a conceptually similar redevelopment like Denver is doing with their Union Station redevelopment, financed in part by federal TIFIA loans? That would take coordination and creativity and now would be the time to plan for it. From what I understand, DART does not want D2 to be U-shaped, ie connecting NW to NE therefore we can’t connect the green/orange lines in the NW to the red/blue lines in the NE. The orange line currently makes this connection, but to make D2 function we have to ensure that red-blue is connected to red-blue and green to green. Ideally, I would imagine that D2 and D1 would each carry two of the four lines through downtown in order to maximize the capacity of the lines. Everywhere to Everywhere. Is ubiquity attainable? To have this route flexibility to connect everywhere to everywhere requires trade-offs. There are no perfect worlds, only the one we live in. As you can see above, I’m highlighting the ‘tragic triangles’ required to allow the trains to make different connections. While these triangles are good for transit, they are terrible for the street network and worse for surrounding private property. The above is a conceptual graphic if all quadrants could run to any other quadrant and with the possibility to run on either D1 or D2. However, the western half of downtown is so encumbered with big, dis-urban infrastructure that this reality isn’t necessarily a net negative. A negative integer multiplied by zero is still zero. However, there is development potential in the eastern half of downtown as well as Deep Ellum. No, really. There is. You just have to have a little imagination. Therefore, if we have to have these tragic triangles, let’s keep them on the west side, avoid them on the east side, and perhaps undo one or two if possible. I’m going to ignore the LPA for the reasons quoted above. The most obvious adaptation of the LPA would be to run it down Commerce as shown above with a couple of variants. We still don’t know how this alignment would coordinate with the proposed South Asian museum site next to the Dallas Aquarium. Getting under 345 is also a challenge (and yet another reason to get rid of it). In order to not disrupt the street grid, in this alignment I’m maintaining it below-grade until it is surfaced on the east side of Good Latimer. Due to limited space, this means the Deep Ellum station goes away. Deep Ellum station is one of the lowest ridership stations in the entire DART system. Furthermore, Deep Ellum wants to rename the Baylor station to Baylor/Deep Ellum since it is closer. The trade-off of this scenario is that Green can only connect to Green and therefore Green would be the only train running on the subway, which doesn’t make a lot of sense from a service to cost ratio. Orange would maintain its current alignment as would Red and Blue. The extent of the below-grade portion is approximately 1.4 miles (yay keep it short). Still a threat to South Asian Museum and Aquarium access. Still major traffic impacts to Victory, Houston, Broom, and McKinney Ave. Eliminates Deep Ellum Station (and no tears are shed). Transfer at West End Station. Likely subway platforms at West End Station, at Akard/Commerce (serving AT&T, the Magnolia, and the Joule), and Pearl (with the potential for one under the proposed Westdale development in Deep Ellum). Again, better to have three than four for cost and spacing considerations. Another potential alignment that has been floated around would be under Elm Street. This doesn’t provide much spacing with D1, which isn’t ideal, but its proximity allows for transfers at West End station. After investigation, there is room to run the existing line from Victory under Woodall Rodgers where it would split off from the existing alignment and begin digging into its trench. There is enough dimension (length and width) behind Corgan architects offices and between the highway columns to get below the existing surface lines and around the Book Depository building. Similar to the previous line, this would also require the elimination of the Deep Ellum/Good Latimer station in order to have the dimension to meet the existing green line behind Reel FX in Deep Ellum. Eliminates the Perot Station. Perot, luv ya, but you’re also about a quarter mile from Victory and West End stations. Perhaps a future streetcar line can serve it? In this scenario, I think we can get down to three total new stations: West End (transfer), Harwood/Pearl (this would suggest the need to acquire the two surface lots between Elm Street and the East End station in order to assemble one large redevelopment), and possibly a third on Elm in conjunction with the Westdale redevelopment. 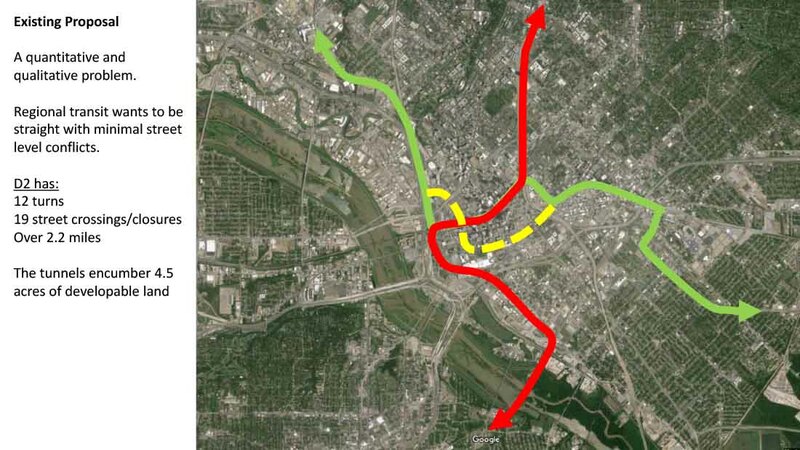 Eliminates Deep Ellum station and again, Green connects only to Green. Trade-offs, innit? This could require a future connection from East End to CityPlace line in order to provide more routing flexibility. Above is the hypothetically preferred conceptual alignment. The specifics aren’t important stepping back to this 30,000 foot level. What I want to explore is are there other ways to make connections without necessarily connecting green to green for D2 and without significantly negatively affecting downtown historic fabric nor potential future redevelopment. 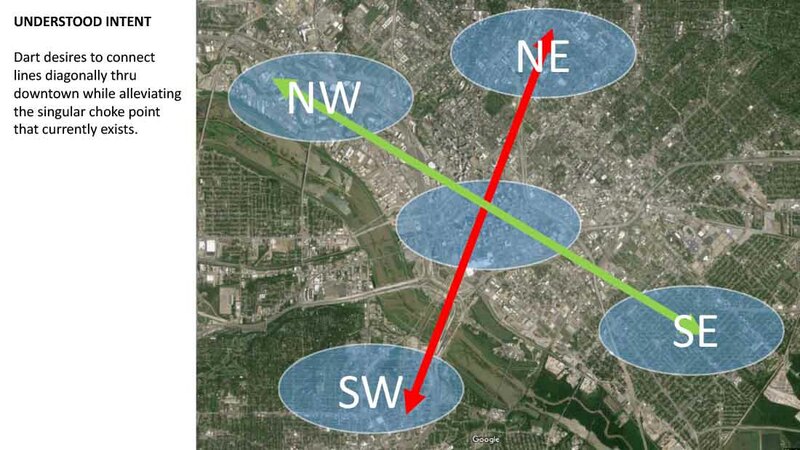 The above is if we said, “what if we follow the goal of building the cheapest possible connection to its logical conclusion.” A Fair Park/South Dallas to Cedars connection could be built at-grade on property that is or once was a surface rail alignment. Due to the lack of development in the area, the impact of the ‘tragic triangles’ is minimal providing the ideal route flexiblity. It also allows for station areas in Cedars and South Dallas and some hoped for new private investment in both areas. This alignment is approximately 1.8 miles and could be built for about a quarter of the downtown-only below-grade alignments. Again, this is the ‘Least Impact, Lowest Cost’ emergency scenario, hence why DART currently uses it during OU/UT weekend. Of course, this suffers from the same flaws as the LPA (albeit in the future). Do the Cedars or South Dallas/Fair Park neighborhoods of 2030 or 2050 want a surface line? Considering the CityMAP proposal for 45/345 brings 45 down to the surface streets around MLK Blvd, a surface alignment here could negatively impact the new surface street capacity CityMAP envisions. Let’s back up further. What if instead of D2 connecting Green to Green, we used D2 in order to connect Red/Blue in the NE to Red/Blue in the SW? Green and Orange would remain on the current Pacific/Bryan surface alignment. In this scenario, Red/Blue would never surface from CityPlace and instead would stay below-grade all the way through downtown where it would meet the existing Red/Blue lines in the parking lot between Dallas Morning News HQ and Union Station. The elevation of this area works to the advantage, there is enough dimension to get below-grade, and the parking lot has very limited development potential so the direct and opportunity costs of building the tunnel entrance are minimal. In this hypothetical scenario, there could be a platform under Ferris Plaza Park, which is the official name for the little under-utilized fountain area in front of Union Station and DMN. A station here could revitalize this plaza while providing direct links to Union Station as well as the Convention Center Hotel. In this case, the Orange Line would probably want to pull into Union Station and back out to its current alignment in order to provide a transfer and direct access from DFW airport to this new multi-modal hub with the convention center hotel and the potential HSR station nearby. Another station could occur on Commerce in the center of downtown serving AT&T and the hotels. Another benefit to this line is the ability to run directly under the East End Transfer Station which could provide a multi-modal transfer hub with the bus system and the Pearl/Arts District station. As I’ve also mentioned, this provides a great opportunity for high quality, mixed-use, mixed-income development via public-private partnership transforming the eastern edge of downtown. 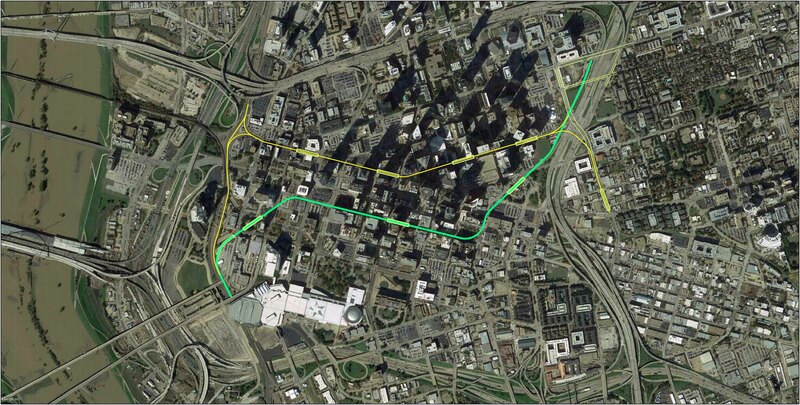 Approximate tunnel length is 1.65 miles, which would stay below-grade from the CityPlace line all the way to Union Station. Eliminates Perot Station, maintains the current green line. Likely orange amendment as mentioned above in order to provide direct DFW airport to Union/Conv Center connection. Reduces D2 platforms to three in order to conserve costs. Allows transfer points at Union and East End, both of which have significant redevelopment potential. Both of which also allow for more funding sources such as federal TIFIA loans and downtown TIF funding in order to increase our local match and improve the overall project grade (oh, and a better city after it’s all said and done – which really should be the primary goal). A variant on the previous, this alignment stays further south in order to serve City Hall and the Farmers Market better. It doesn’t serve existing CBD ridership generators in the center of the CBD as well, but it increases the overall coverage. The Farmers Market is an emerging destination and it is also up around 3,500 residents (which is now nearly half of all the downtown resident population), as this corner of downtown emerges as both trip origin as well as destination. 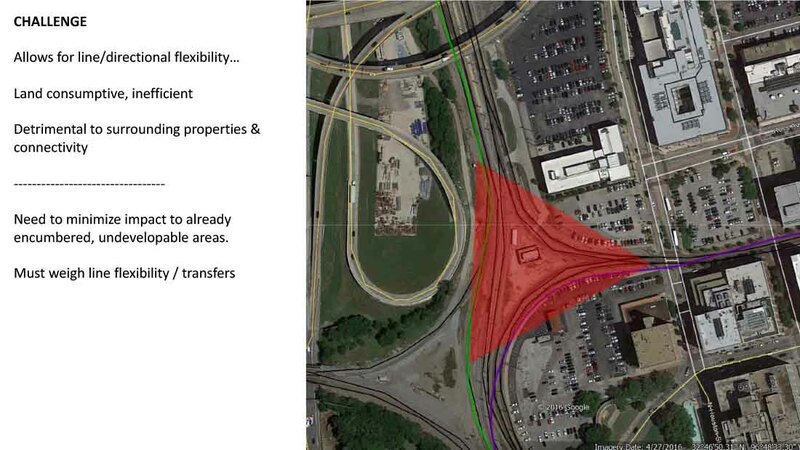 Similarly, transfers occur at Union/Ferris Plaza and a new East End transfer/multi-modal, mixed-use redevelopment. Swinging further south might compel a fourth station on Cadiz serving the Farmers Market area. Longest of all alignments at nearly 2 miles below-grade. Red/Blue to Red/Blue never surfaces from CityPlace to Union/Convention Center area. Encourages redevelopment of East End transfer hub. Serves Government Center and Farmers Market areas. In conclusion, this is simply to stir discussion with the understanding that no alignment will be perfect nor serve every stakeholder equally. Transit can’t do that. With transit alignments, there are winners and (potentially) losers. Let’s hope we can all collaborate towards building a better downtown Dallas and having a transit system that augments that future vision of downtown so that everybody feels like a winner after the process. But for everybody to win, nobody can win everything they want. Everybody has to give. And that’s the fundamental nature of cities. For everyone to gain a lot, we all have to give a little. Civilization, it’s never not a struggle.